My parents are visiting from the UK & luckily my mums birthday is today, which means I get to celebrate with her (I've missed the last 5 birthdays since living in Melbourne). I promised my mum before she arrived that I would make her whatever dessert she wanted for her birthday dinner, her favourite flavour is lemon so naturally I decided to make her a citrusy lemon tart. I always think gluten free pastry tends to be quite bland & heavy but there is a fabulous recipe for sweet tarts on the Cannelle et Vanille blog. I found a multitude of recipes for lemon curd & tart filling but in the end I used a recipe from my 'Essential Baking' cookbook which sounded perfectly tart & not too sweet. Happy birthday mum & I hope you enjoy your special dessert tonight! Make the pastry recipe and place in the fridge for one hour. Once pastry has cooled knead lightly & roll small batches for your tart tins. Pierce a few small holes in the tarts with a fork, cover with baking paper & fill the tins with tart weights or dried beans. Bake the tart cases at 180C for 15 minutes then remove the baking paper & weights, bake for another 5 minutes then remove from oven & leave to cool. 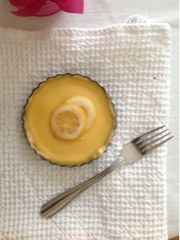 While the tart cases are cooling start to make the lemon filling. Whisk the eggs, extra yolks & caster sugar together. Add the cream & lemon juice & mix well. Strain the mixture then add the lemon zest. When the tart shells are cool fill them to the top with the lemon mixture & bake for 30mins at 150C until the filling is set & slightly wobbly in the middle. 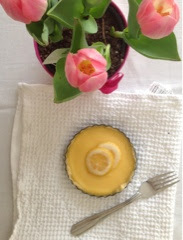 While the tarts are baking you can prepare the lemons for decorating. 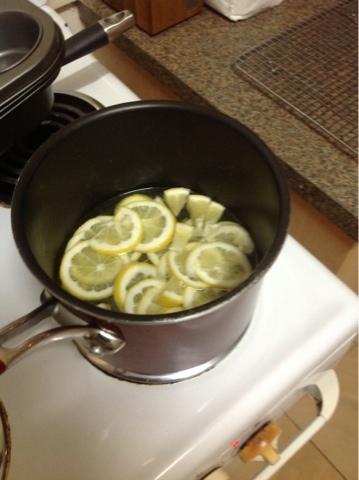 Wash the 2 small lemons & slice very thinly. Combine the sugar & water is a small saucepan on a gentle heat. Place sliced lemons in the saucepan & leave to gently simmer for 30-45 minutes or until the pith looks translucent & tender. Remove lemons from the pan & place the slices individually on baking paper to dry. Decorate the tarts before serving and enjoy! So glad i found your blog. my 9 months old baby is still not allowed gluten and wheat flour yet. i need gf recipes!